Is Miami’s luxury condo market in a bubble? Some will tell you it’s a stupid question to ask; that of course the market isn’t in a bubble; that the market has taken precautions this time around. But according to Jack McCabe, a Florida-based real estate analyst with McCabe Research and Consulting, those people are wrong. His answer to the “stupid” question is “yes,” according to Housing News Report. During the buildup to the mortgage crisis in 2007, McCabe was ahead of the collapse, predicting the downturn. And looking at Miami’s luxury condo market today, he notices a few similarities – namely, a hoarding of inventory. 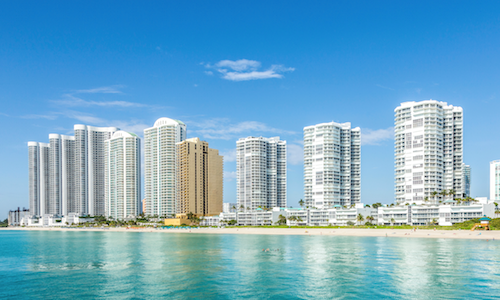 According to a new report from Douglas Elliman, in the second quarter of 2016, Miami’s luxury condo supply increased 78.3 percent year-over-year and average sales price increased 12.7 percent to $1.8 million. Alone, those figures suggest a radical jump in demand. However, that’s just not the case. Sales were down 13.5 percent over the same period and days on market more than doubled since Q2 2015, rising from 51 to 104. But one difference McCabe sees between Miami’s market today and the nation’s market leading up to the housing crisis is that the global economy is already in recession. Instead of the U.S.’s economic problems tainting global markets, this time it will be the reverse. International sales volume was down in 2015, according to the National Association of Realtors foreign homebuyers report, and McCabe’s worry is that the lost capital in Miami will see the city’s luxury condo market continue to inflate and then pop.